I feed for three weeks in the spring, before the honey supers go on, and three weeks in the fall after the honey is harvested. I feed cane syrup with essential oils. My spring feed has two components. 1) There is no forage from October to April in our area. Although I leave about 70 pounds of honey on each hive, by March there is a good possibility of stores being very low. This is especially true in a mild winter when the bees do not go into tight cluster and carry on eating their honey (the nerve of ‘um). We just had a mild winter. It’s the first year in a decade where we could drive to the farm every day. Normally, for one to two weeks each winter, the snow is too deep to get up the hill to the farm even with 4-wheel drive, snow tires, and chains. Mild winters are easier on me (no ¾ mile walks though the snow with groceries), but harder on the bees because they eat a lot of food and can run out by spring. 2) I want my bees to be building up by the blooming of the Big Leaf Maples. These are our first major nectar source. The Alders and wild Hazelnut trees have been providing pollen, but the Maples are the bees’ first sweet taste in the year. Every year I write down when the flowers bloom (and when birds arrive, when green plants emerge, and the weather – good notes going back years are worth their weight in honey). By my notes, the Maples should go into bloom around the second week in April. Thus I need to start my up-river bee yard feedings in the third week of March. 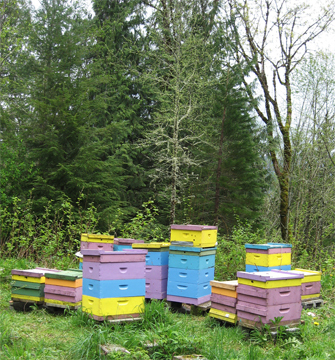 The concept is build up, but no feed when the Maples bloom – so the bees will concentrate on them. Of course nature does not follow humans’ plans, so I can be off by a week or two. I had intended to start my down-river hives a week earlier than my up-river hives, but it rained for two weeks straight at that time. I don’t open hives in the rain if it is not critical to do so. I’m finally getting a chance to post this at the beginning of the second week of April. I just finished the final feed on Friday. That was the same day that I saw my first up river blooms of Big Leaf Maples. So, a week earlier start would have been better (but it had rained for 2 weeks at that time). 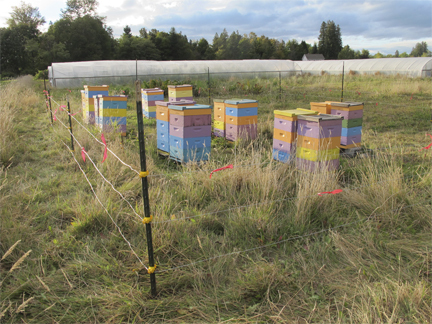 I keep bees along a west to east corridor in the most northwest county in Washington state. 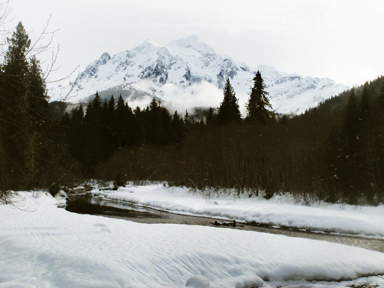 The route falls pretty much along the North Fork of the Nooksack River. The down river (westerly) bee yards see spring at least a week earlier than my up river (easterly) bee yards. 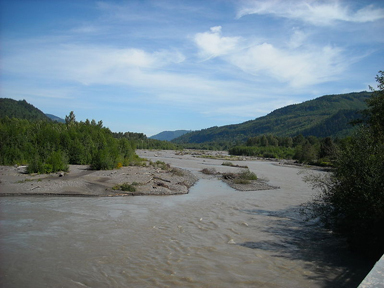 The down river yards are in berry country – Whatcom county is the largest producer of Raspberries in Washington state, and Washington state is the largest producer of raspberries in the US (according to the internet). The up river yards are in mountain wildflower country. The road along the river turns about 10 miles up river from my last bee yard and climbs to Mt. Baker, the second most glaciated mountain in Washington. Have I mentioned how beautiful it is here? Feeder after bees have dined. 1) Remove the insulation that has been on the burlap that’s on the top bars. 4) I add the feed. I started with a recipe I found on line; then over the years, made changes. Nothing, I repeat nothing is scientifically tested – this just seems to work for me. The following is based on making a pot of feed that produces 3.5 gallons of feed. The pot I use is a four-gallon cook stew pot (if someone can explain the discrepancy to me, between the full 4-gallon pot and resulting 3.5-gallons of feed, please let me know. I’ve always wondered). Bring water to boil on stove. Remove and let cool a bit – cold rooms, less time than warm rooms. Add cup of essential oils, lecithin and water. If another batch is to be done: RINSE OUT THE CUP THE OIL WAS IN BEFORE STARTING AGAIN – other wise the lecithin won’t dissolve as well (took me ages to figure that out). I do 3 pots at a time, and make just over 90 gallons of feed each spring and fall. I’m writing this just as I have just finished all the feeding. Some bees are chowing down heavily, some are eating at a steady pace, and some are ignoring the feed. Happily, most hives have lots of honey left from last year – and no matter what I feed them; their honey is the best thing they can eat. 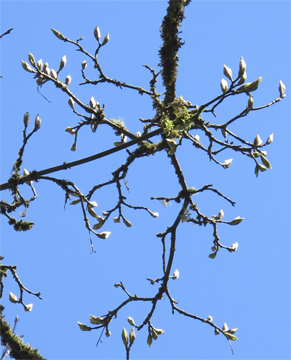 Best yet, we’re about to go into 3 to 4 weeks of Big Leaf Maple Bloom, followed by vine Maples. Now if it would just stop raining (yes the rains came back, as they always do here). That’s the news from Brookfield Farm Bees and Honey. Do you feed? If so, what do you use? I learned about Tea Tree Oil from another beekeeper. Another friend is experimenting with putting stinging nettles and dandelion leaves in the syrup water (I’m very interested to see how that goes for him). 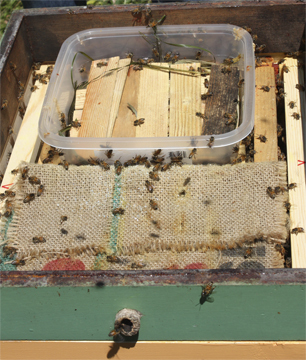 Beekeeping’s all about constant learning and evolving – the bees don’t stop changing, so we need to change with them. This entry was posted in 1 Beekeeping, 4 Feeding Bees and tagged bees, Brookfield Farm, feed, honeybees, how to, Maple Falls, recipe, spring, syrup, Washington, why. Bookmark the permalink. This is very timely and helpful! Thanks for posting!! I am keen on raising bees in the near future so your information is really helpful and much appreciated. Crocuses and Daffodils are blooming here in south-east Idaho. Very soon the dandelions as well as the Apricot tree, a week or two away, followed by the Cherry, plum, then Apple. Of course the Maples about 5 blocks away. The honey flow will be on very soon. Bees are doing quite well. Thyanks for the technical information you send to me. I urgently need a bee suit. How can I get one in 5 days back in Yaounde, Cameroon? Thank you. I’m glad I’ve given some inspiration for you start a website. My only advice is “be gentle with yourself”. The internet never ceases to confuse me with changes and glitches…. Hi Karen, thanks for the syrup recipe! How did the dandelion and stinging nettles additions go for your friend. I have been looking at the Red Clover Tea in my local health food store and thinking hmmm……. At one time in my life I owned a couple mineral claims in Arizona. The nearest town had a very large commercial honey operation and had a contract with BLM to place hives on BLM land on my claims. You would not think there was much forage for honey bees in the high desert of Arizona and you would be correct. The commercial operation fed their hives by digging pits, lining the pits with plastic and filling them with sugar syrup. 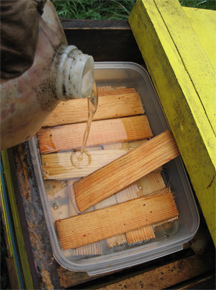 To keep the bees from drowning they placed straw on top of the syrup. This gave the bees lots of floating surface to walk or stand on while feeding. It seemed to work quite well. .
Perhaps a dollar store container with straw on top for the bees to walk on while feeding.